The goddess Sarasvati is usually depicted playing stringed instrument, often riding a peacock or a swan. In the other two of her four hands she holds a string of prayer beads and the Vedas, the sacred Hindu text. In some images she holds, instead of an instrument, a lotus blossom and a water jug. She is the deity of language and learning, the patron of the arts and sciences, especially music, and is credited with the invention of the Devanagiri script of Sanskrit and Hindi. 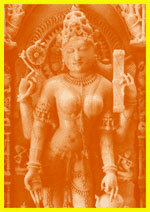 She is the wife of Brahma, the creator. She bestows the greatest welfare on mankind - the bounty of knowledge. The goddess Durga Ma is honoured many times during the year, but Sarasvati only once, at one of the largest annual festivals, Basant Panchami. Basant falls on the fifth day of the new moon in the month of Magh (the end of January). "Aya Basant Pala Urant" - "comes Basant (spring), flies the winter" - goes a popular saying in north India, where the cold, bleak days make way for warm balmy breezes. The fields are filled with the dazzling beauty of yellow mustard flowers, and everyone comes out to celebrate. Children have a wonderful time, and can be seen flying kites on roofs or any open space. People wear bright yellow, the colour believed to bring luck. There is no ceremonial lunch; activities are concentrated outside the home, as well as visits to the temple and relatives. Families meet to enjoy conversation and refreshments in a festive atmosphere. Appropriately for the festival honouring the patron of all places of learning, schools and institutes celebrate Basant Panchmi with large parties.